If quality jewellery matters to you, then you have come to the right place for sure. We deal in a wide range of crystal bracelets that not only will keep you in style but also bring more happiness and peace in your life. What is more, they will also give you the right way to meet your ultimate destination and your desire. Crystal bracelets are not only the pieces of exotic stones, but they hold energy of nature that avoids all negative vibrations. Truly speaking, they are the source of your healing journey (i.e. physical and emotional healing) to build you and to recreate you naturally in order to reconnect your soul to love, light and peace. 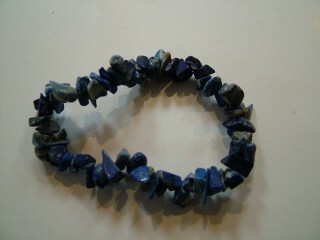 Agate Gemchip Bracelet. Pretty decorative wear with the added bonus of beneficial properties. Aga.. These stylish bracelets are crafted from polished crystal. A great way to benefit from your favourit..
Amethyst Gemchip Bracelet. Pretty decorative wear with the added bonus of beneficial properties. .. Pretty decorative wear with the added bonus of beneficial properties.Made from 7 different crystal s..
Green Aventurine Gemchip Bracelet. Pretty decorative wear with the added bonus of beneficial propert..
Agate Gemchip Bracelet. Pretty decorative wear with the added bonus of beneficial properties. Hem..
Leopard Skin Jasper Gemchip Bracelet. Pretty decorative wear with the added bonus of beneficial prop..
Orange Calcite Gemchip Bracelet. Pretty decorative wear with the added bonus of beneficial propertie..
Red Aventurine Gemchip Bracelet. Pretty decorative wear with the added bonus of beneficial propertie..